Trabon MSP Divider Valves from MotionSource are genuine Trabon from Graco. It’s industry standard for quality, reliability, and ease of use features. Trabon was the original modular-style series progressive divider valve–and customers agree it’s still the best! A Series-Flo type divider valve is a manifold proportioning device consisting of an inlet and end section plus a minimum of three valve sections. The divider valve is manifolded together with tie rods and nuts. A master divider valve is the first divider valve downstream from the lube pump. A secondary divider valve is any divider valve receiving lubricant from the master divider valve Graco is pleased to now offer MSP Stainless Steel Divider Valves! You get more durability with the same high-quality performance and precision machining as the carbon steel version. Call us for a free quote, 888-963-6686 or email Sales@MotionSource1.com or simply complete the Quick Quote form to your right and we’ll give you a call back! With lubrication kits in stock and ready to ship, give us a call at MotionSource today. 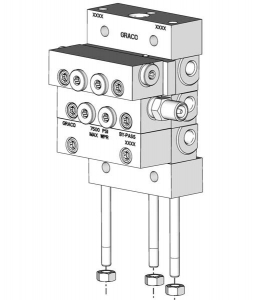 We can design and build your Trabon MSP Divider Valves configuration and ship same day! The new stainless-steel MSP valves and accessories are made for harsh and food grade conditions. Salty air or areas needing repetitive cleaning, with durable 303 materials and a design with proven success. MotionSource specializes in MSP valve assemblies, built to your specs. Not sure what you need? Speak with any of our Graco trained technicians and we’ll make sure your configuration is right. 100% guaranteed. For the food service and processing industry, stainless steel is a must. Trabon MSP valves by Graco are available at MotionSource in stainless steel. Order Today, Ship Today with MotionSource. We can build MSP valve assemblies to ship the same day insuring your equipment stays running. Give us a call, 888-963-6686 or use the “Quick Quote” form to tell us what you need.